David Berney received a two-year sentence today for burglary, but had 18 months suspended for the looting incident. A CONVICTED BURGLAR who took part in shop looting during the extreme weather of Storm Emma last March has been jailed. 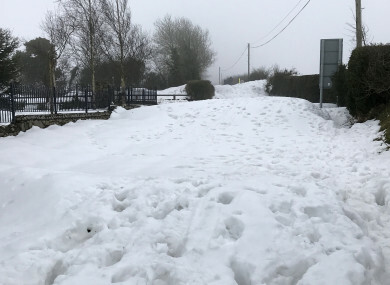 Lawyers for David Berney (37) told Dublin Circuit Criminal Court that like many people, Berney was reminded of his childhood by the heavy snowfall. “But unlike others he was high on cocaine at the time,” Eoin Lawlor BL, defending, told Judge Cormac Quinn. Berney of Suncroft Park, Tallaght, Dublin pleaded guilty to burglary of the Centra store in Jobstown, Tallaght on 2 March last. He was on bail at the time awaiting prosecution for a burglary of a private home at Rocklodge, Stepaside on 3 December 2014 and has since pleaded guilty to that offence. Berry said that Berney’s offending constituted crimes of acquisition to “feed his drug habit”. He has previous convictions for robbery, assault, burglary and making threats to kill or cause serious harm. Judge Quinn imposed a two-year sentence for the 2014 burglary. He imposed a further 18 months for the looting incident but suspended this term on condition that he keep the peace and engage with addiction and social reintegration services. Berney was found hiding in the back of the shop in a cash room. Another man, who is still before the courts, was in his company and this man had used a sledgehammer to smash their way into the back offices while others looted the shop. Detective Garda David Jennings told Eoghan Cole BL, prosecuting, that on 2 March last gardaí in Tallaght became aware of looting at the Centra store. At the time most shops had closed due to the severe weather warning. He said because of the severe weather, officers travelled to the shop in an official jeep. They were forced to abandon the 4×4 before reaching the shop because the road was impassable with the snow and other abandoned vehicles. He said there were around 20 people at the scene. A “con saw” had been used to cut a hole in the security shutters and people were running in and out of the shop. People began shouting “garda garda” to alert others who were still inside the shop, but the shop’s alarm was ringing so the shouts could not be heard from inside, Dt Jennings said. He said Berney had entered the shop about 90 seconds before gardaí arrived. While others were looting the shop, Berney and two other men had gone to the back of the shop where the store room was. Another man had a sledgehammer and used this to smash the store room door open, and the three then entered the cash room inside. Counsel for Berney said he is willing to work on his rehabilitation. During court proceedings, the aforementioned Storm Emma was incorrectly referred to as Storm Katrina. Email “Defence lawyer says Storm Emma looter was 'high on cocaine at the time'”. Feedback on “Defence lawyer says Storm Emma looter was 'high on cocaine at the time'”.